Download "WHITEPAPER. 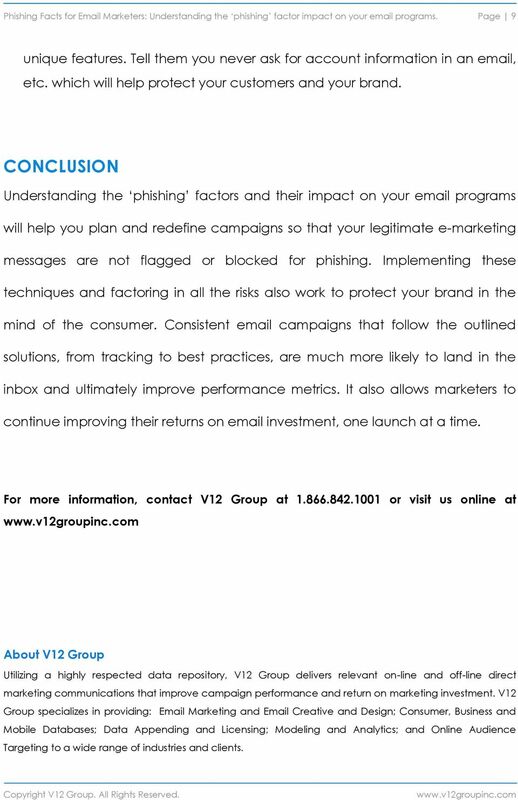 V12 Group www.v12groupinc.com 141 West Front Street, Suite 410 Red Bank, NJ 07701 info@v12groupinc.com 1.866.842.1001"
2 Phishing Facts for Marketers: Understanding the phishing factor impact on your programs. 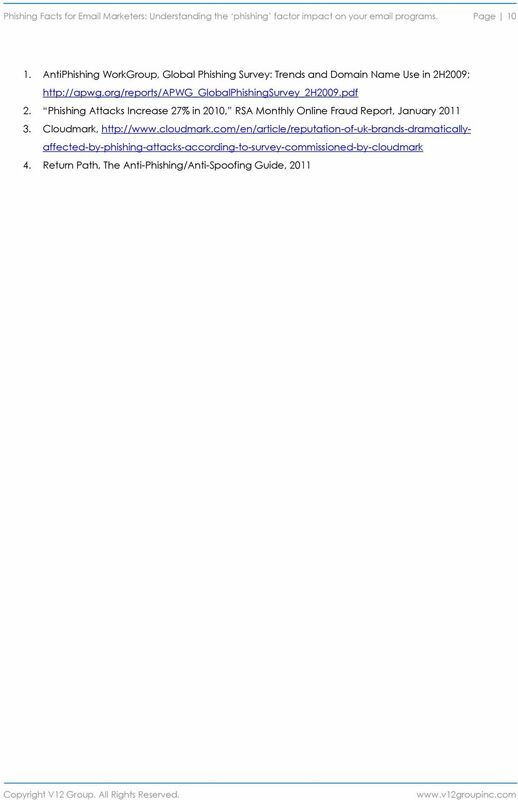 Page 2 phishing attacks are destructive for everyone, it s not just the brands (and their customers) who fall victim to this scam...it s the entire community who will feel the effects. 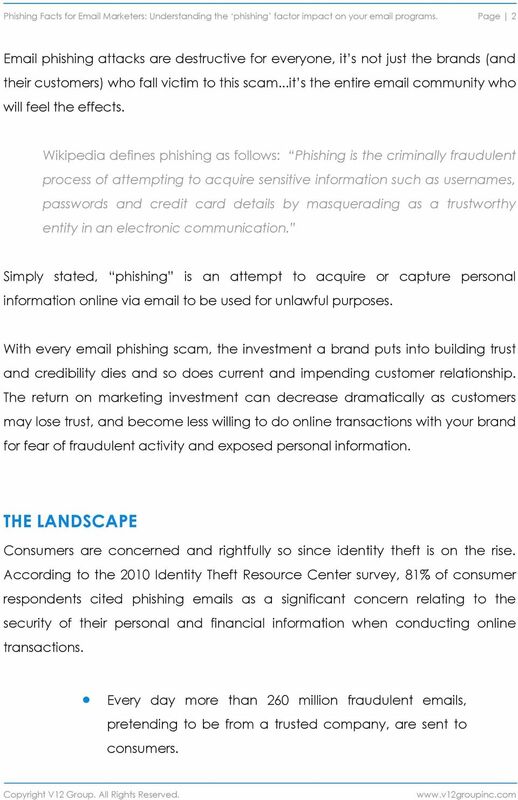 Wikipedia defines phishing as follows: Phishing is the criminally fraudulent process of attempting to acquire sensitive information such as usernames, passwords and credit card details by masquerading as a trustworthy entity in an electronic communication. Simply stated, phishing is an attempt to acquire or capture personal information online via to be used for unlawful purposes. With every phishing scam, the investment a brand puts into building trust and credibility dies and so does current and impending customer relationship. The return on marketing investment can decrease dramatically as customers may lose trust, and become less willing to do online transactions with your brand for fear of fraudulent activity and exposed personal information. THE LANDSCAPE Consumers are concerned and rightfully so since identity theft is on the rise. According to the 2010 Identity Theft Resource Center survey, 81% of consumer respondents cited phishing s as a significant concern relating to the security of their personal and financial information when conducting online transactions. Every day more than 260 million fraudulent s, pretending to be from a trusted company, are sent to consumers. 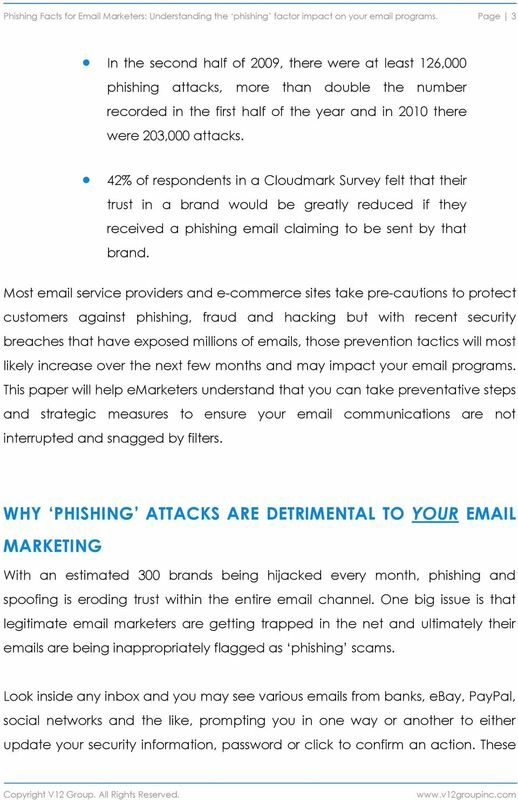 4 Phishing Facts for Marketers: Understanding the phishing factor impact on your programs. Page 4 s are trying to convince you that they are who they say they are. Once you click and enter your personally identifiable information, they can steal your identity and even wipe out a bank account! So, obviously, ESPs are fighting to stop these scams, leaving marketers with the task to ensure that their legitimate e-marketing messages are not flagged for phishing. WHAT DOES A PHISHING AND LINK LOOK LIKE? 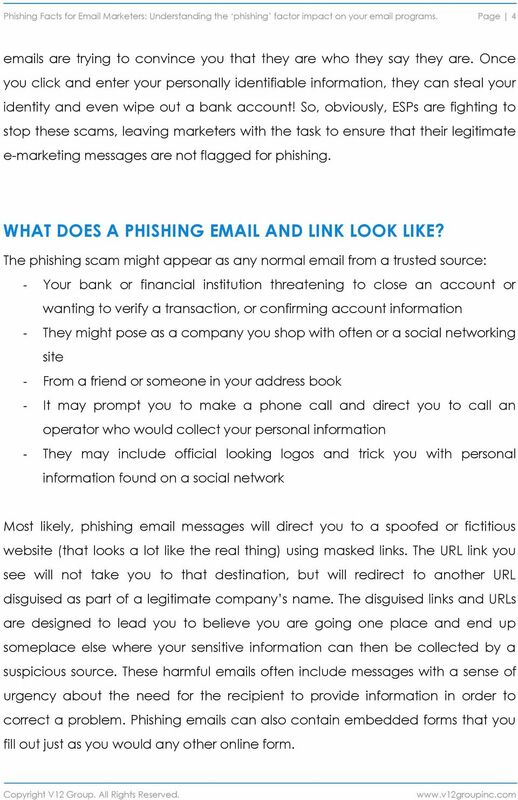 The phishing scam might appear as any normal from a trusted source: - Your bank or financial institution threatening to close an account or wanting to verify a transaction, or confirming account information - They might pose as a company you shop with often or a social networking site - From a friend or someone in your address book - It may prompt you to make a phone call and direct you to call an operator who would collect your personal information - They may include official looking logos and trick you with personal information found on a social network Most likely, phishing messages will direct you to a spoofed or fictitious website (that looks a lot like the real thing) using masked links. The URL link you see will not take you to that destination, but will redirect to another URL disguised as part of a legitimate company s name. The disguised links and URLs are designed to lead you to believe you are going one place and end up someplace else where your sensitive information can then be collected by a suspicious source. These harmful s often include messages with a sense of urgency about the need for the recipient to provide information in order to correct a problem. Phishing s can also contain embedded forms that you fill out just as you would any other online form. 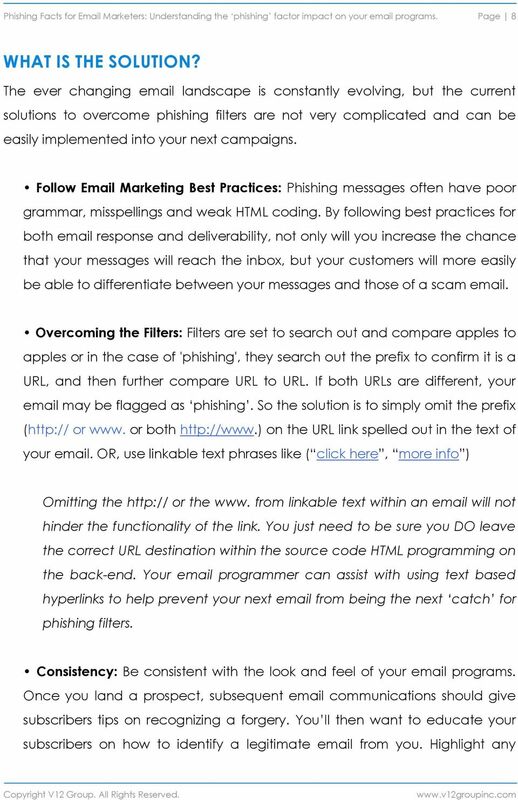 7 Phishing Facts for Marketers: Understanding the phishing factor impact on your programs. Page 7 When testing your next campaign, the client will review the text within the creative and identify if the link destination is the same as the link text. If it matches, your will pass the phishing test. 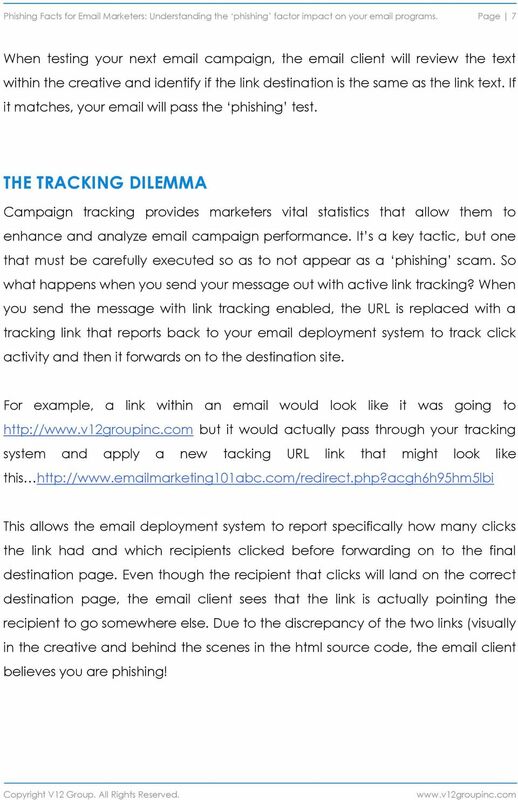 THE TRACKING DILEMMA Campaign tracking provides marketers vital statistics that allow them to enhance and analyze campaign performance. 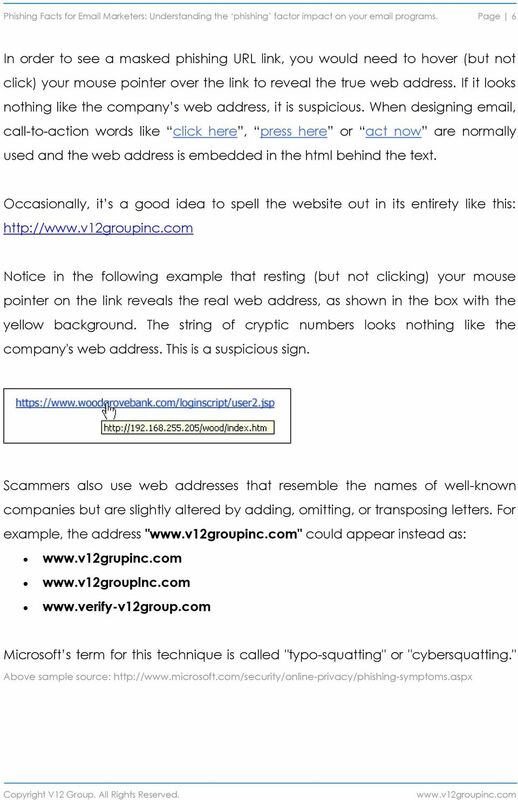 It s a key tactic, but one that must be carefully executed so as to not appear as a phishing scam. So what happens when you send your message out with active link tracking? When you send the message with link tracking enabled, the URL is replaced with a tracking link that reports back to your deployment system to track click activity and then it forwards on to the destination site. For example, a link within an would look like it was going to but it would actually pass through your tracking system and apply a new tacking URL link that might look like this This allows the deployment system to report specifically how many clicks the link had and which recipients clicked before forwarding on to the final destination page. Even though the recipient that clicks will land on the correct destination page, the client sees that the link is actually pointing the recipient to go somewhere else. Due to the discrepancy of the two links (visually in the creative and behind the scenes in the html source code, the client believes you are phishing! 9 Phishing Facts for Marketers: Understanding the phishing factor impact on your programs. Page 9 unique features. Tell them you never ask for account information in an , etc. which will help protect your customers and your brand. 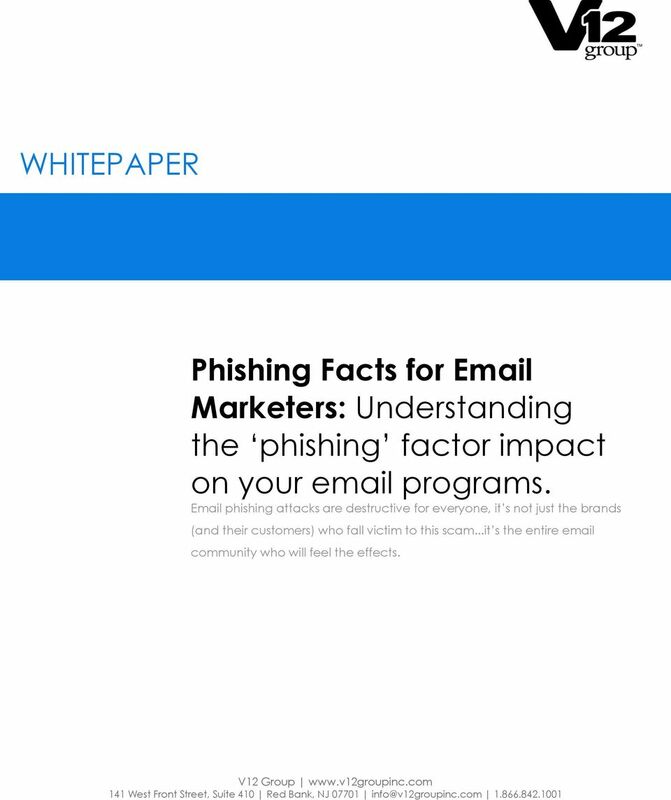 CONCLUSION Understanding the phishing factors and their impact on your programs will help you plan and redefine campaigns so that your legitimate e-marketing messages are not flagged or blocked for phishing. Implementing these techniques and factoring in all the risks also work to protect your brand in the mind of the consumer. Consistent campaigns that follow the outlined solutions, from tracking to best practices, are much more likely to land in the inbox and ultimately improve performance metrics. It also allows marketers to continue improving their returns on investment, one launch at a time. 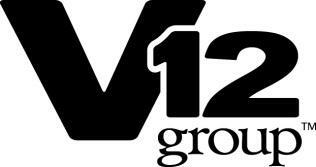 For more information, contact V12 Group at or visit us online at About V12 Group Utilizing a highly respected data repository, V12 Group delivers relevant on-line and off-line direct marketing communications that improve campaign performance and return on marketing investment. V12 Group specializes in providing: Marketing and Creative and Design; Consumer, Business and Mobile Databases; Data Appending and Licensing; Modeling and Analytics; and Online Audience Targeting to a wide range of industries and clients. White Paper August 2005. 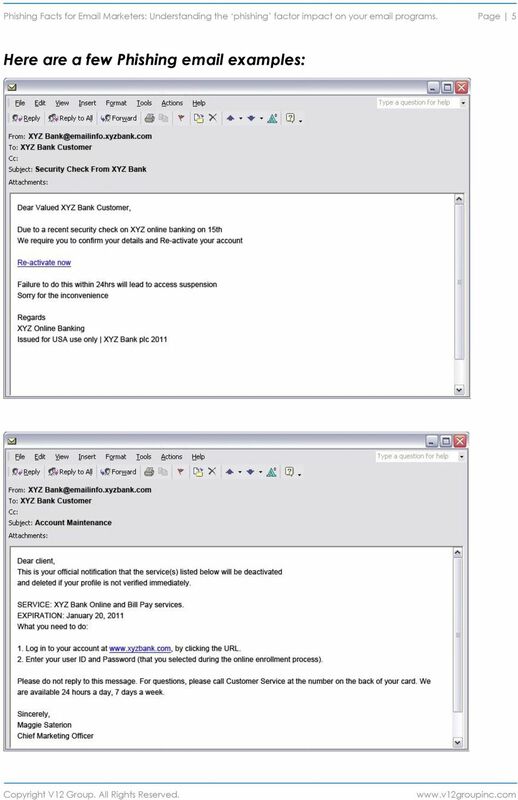 McAfee Phishing/Pharming. Phishing & Pharming Understanding Phishing and Pharming. 25 STEPS TO SAFE ONLINE SHOPPING There exists a tremendous difference between what computer users should do to enhance their cyber security and what they really do. What is the primary reason for this? 3 day Workshop on Cyber Security & Ethical Hacking 1 st day-highlights-hands On Phishing Attack Hammad Mashkoor Lari Freelancer What is Cyber Security? What is Ethical hacking? What is Computer Science? Hello. If you have any questions that aren t addressed here, feel free to contact our support staff. Cyber Crime: You Are the Target When talking about computer crime, we often hear the observation from computer users that they aren t rich and therefore what they have isn t worth much to a cyber criminal. Are your people playing an effective role in your cyber resilience? Crash Course: E-mail Etiquette No longer the domain of just the technically savvy, e-mail is used by just about everyone. Microsoft Outlook alone is used by an estimated 120-million-plus people worldwide.